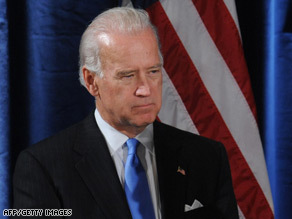 Vice President-elect Joe Biden will head a new task force on working families on Jaunary 20, 2009. WASHINGTON (CNN) - Come Inauguration day, newly minted Vice President Joe Biden will add one more task to his job title: working families czar, so-to-speak. On Sunday, President-elect Barack Obama's transition team announced the new "White House Task Force on Working Families" - a major initiative targeted at "raising the living standards of middle-class, working families in America." The initiative will be chaired by Biden. Other members of the task force will include: Secretaries of Labor, Health and Human Services, and Commerce, as well as the Directors of the National Economic Council, the Office of Management and Budget, the Domestic Policy Counsel, and the Chair of the Council of Economic Advisors. "The one thing that we use as a yardstick of economic success of our administration: Is the middle class growing? Is the middle class getting better? Is the middle class no longer being left behind? And we'll look at everything from college affordability to after school programs ... I will be the guy honchoing that policy," he said. Biden said he will have the authority to get a consensus among the task force - but will use his relationship with the president if a consensus isn't reached. "If in fact there is no consensus, [I'd] go to the president of the United States and say, 'Mr. President, I think we should be doing this, cabinet member so and so thinks that. You're going to have to resolve what it is we think we should do.'" Obama has set up several key goals for the task force, including: Expanding education and training; improving work and family balance; a focus on labor standards, including workplace safety; protecting working-family incomes and retirement security. So what power will the new task force have in shaping policy? According to the transition team, Biden and other members "will expedite administrative reforms, propose Executive orders, and develop legislative and public policy proposals that can be of special importance to working families." Anna Burger, chairwoman of Change To Win - a group made up of seven unions - hailed today's announcement. "Today's announcement shows that President-elect Obama is committed to middle class families and change truly is coming to Washington. Working people finally have an administration that is willing and eager to take action to address their needs," she said in a statement. "The White House Task Force on Working Families is a vital first step toward restoring our economy and making government work for working people again." New Yorker : Ditto, but unfortunately some people believe it is there 'civic duty" to pay more taxes and "help out"! Can you imagine!!! We can't afford the standard of living in our country now. We should be encouraged to LOWER our standard of living and stop borrowing to raise it. Our policies as a country should DISCOURAGE SPENDING and ENCOURAGE SAVING!!! Sadly, our government seems to think that a debt based economy makes good sense. It does make good slaves. I hope the era of non-accountablilty is over and the next president will again adhere to the motto: "The buck stops here!" I don't agree with New Yorker... I suggest he read Upton Sinclair's THE JUNGLE, if he wants to know what happens when the government steps out of the way and let's BIG BUSINESS have full reign with no regulation. We have nearly come to that point under the Bush administration. I am grateful that Obama is going to reverse that trend with VP Biden's new role, and his support of the very people Bush has ignored for the last 8 years. TO JACKSON- YOU SAY OBAMA / BIDEN THE MOST DIAPPOINTING SCANDAL RIDDEN ADMINISTRATION SINCE THE DRAFTING OF THE CONSTITUTION......WOW!!!! MAN YOU NEED HELP..... I HAVE TWO NAMES FOR YA! BUSH / CHANEY. TAKE OFF THE TIN HAT. Can we just retire the word 'czar' in this sort of context alongside the suffix '-gate'. Both have been so overused as to be meaningless. Why in a "democracy" such as ours, do we insist on using labels such as "czar"? I believe unification is our only hope. We need to seriously go back to when things were good. Buying American and boycotting anything foreign made (whenever possible). The American people – NOT POLITICIANS – are the answer. I found some really cool bumper stickers on EBAY that blast Shelby for his disgusting comments about our unions and the Big 3. It may be a small thing but I'm buying them for my vechicles and doing my part!!! That's where it all starts! Does anyone in our government really care about what is happening to the real people of this country. So far it's a lot of talk and not much action to help working families. I see it as say anything they think people want to hear. As for the increase in pay for congress – we the people should be up in arms over this. What the heck are they thinking? That just shows they could care less. I think this is WONDERFUL! God bless Joe Biden and Barack Obama! To all you naysayers – Don't you have a Rush Limbaugh program to tune in to? Keep your Conservative gloom and doom to yourself. No one wants to read you. The much needed Political LANDSLIDE has begun!